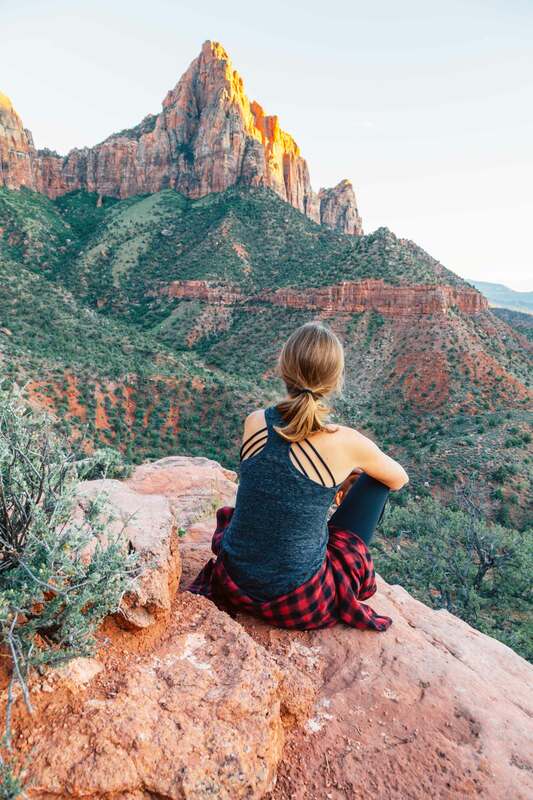 Zion National Park is one of the most visited National Parks in the country, which means it can start to feel very small during the busy season. Crowd management has gotten a lot better since the park introduced the main valley shuttle system, but it can still feel a little overwhelming – especially during the summer. 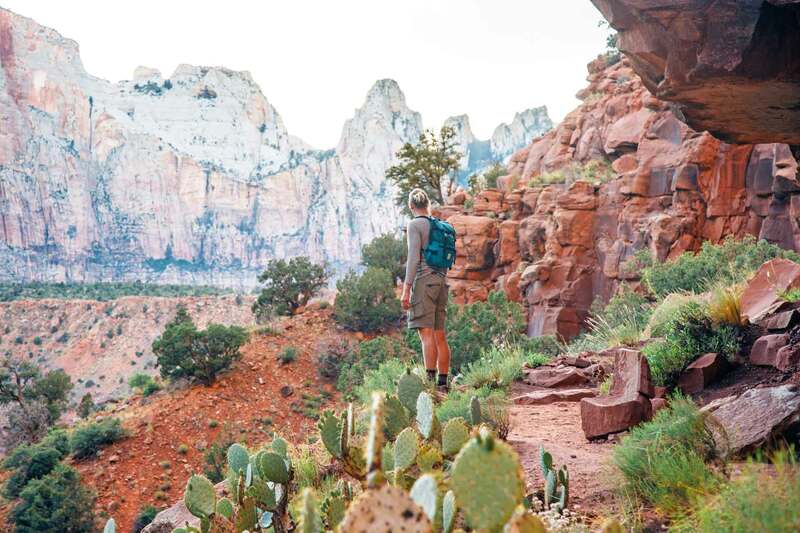 Nevertheless, there are plenty of ways to find a little peace and quiet while visiting Zion. 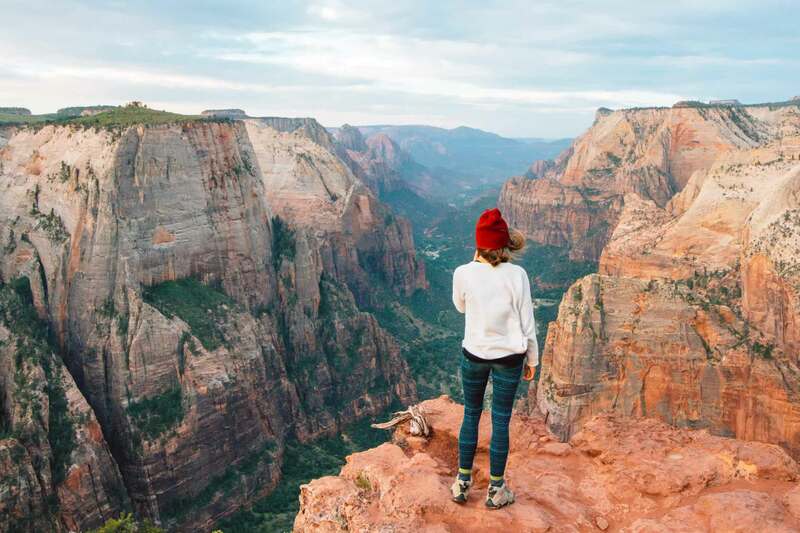 We are just about as crowd-averse as you can get (an ill-effect of living in Los Angeles for so many years) so we compiled a list of places to explore in Zion to help you beat the crowds. While there’s bound to be people wherever you go, these places will at least allow you avoid the majority of the masses. We were sitting at Zion Canyon Brew Pub enjoying a late afternoon beer when we realized the sun was starting to set. Everyone in our group told us the best place to catch sunset was from Canyon Junction Bridge. We had already missed the last shuttle, so we quickly gathered up our things and booked it into the park on foot. However, while speed walking we got turned around and found ourselves starting up Watchman Trail. There didn’t seem to be anyone else on the trail and we could see the sunlight hitting the east side of the canyon just above us, so we decided to chase after it. We quickly rose up into the hills and away from the hustle and bustle of the visitor center below. Steep and gravelly in a few sections, it was pleasant hiking in the cool afternoon air. After about 1.5 miles we arrived at an overlook point that offered views to the south and west. While it didn’t bring us to the top of The Watchman, it did give us an excellent vantage point to see the last of the sunlight slipped over the cliff face. At the top, we were joined by three other guys who had hiked up from Watchman campground. But aside from that, we had the view all to ourselves. We fell into conversation with them between casually snapped photos of the sunset. After the sunset, we all walked down together in the dark. While the iconic shot might have been down at the Canyon Junction bridge, we were happy with the company we had made up on the mountain. If you’re looking for a lesser traveled trail to catch sunset or sunrise – right next to park entrance – then we’d definitely recommend Watchman Trail. 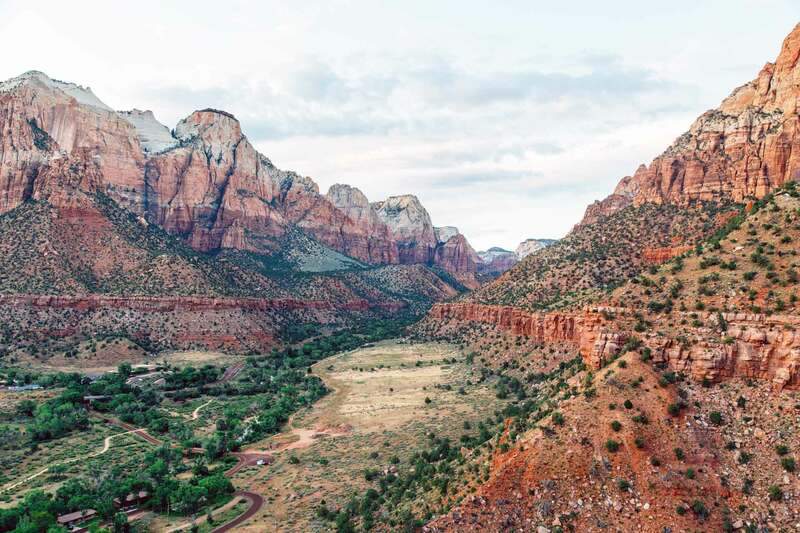 For more information about the hike, including a trail map, check out Joe’s Guide to Zion National Park. 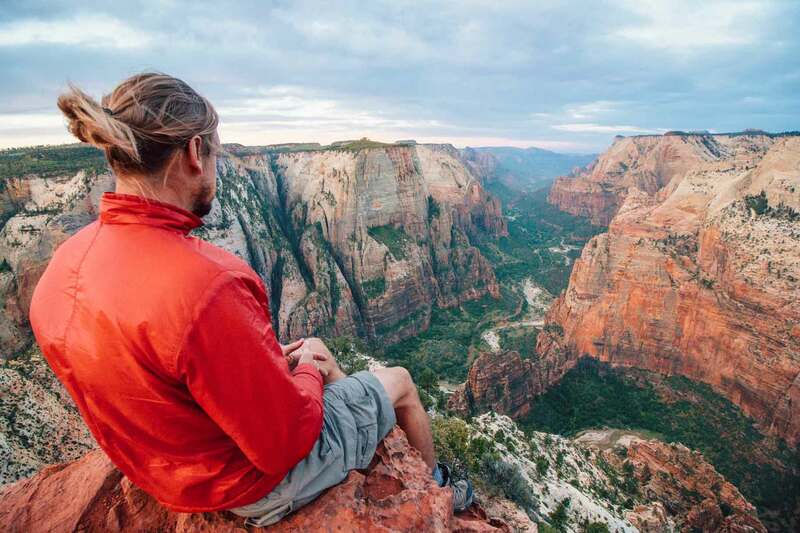 During our stay in Zion, everyone we met seemed to be transfixed with the idea of hiking Angel’s Landing. For those that don’t know, it’s one of the park’s most famous (infamous?) hikes, that takes visitors along a hair-raising ridge trail with steep, thousand foot drop-offs on either side. When we arrived at the shuttle stop for the trailhead, nearly the entire bus piled off. 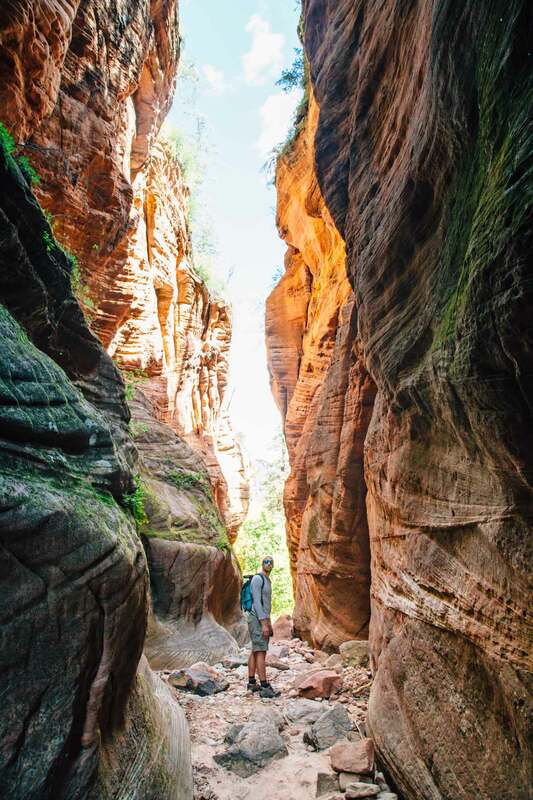 Somehow the idea of jostling along a cliff’s edge with a bus load of tourists didn’t sound all that appealing (especially to Michael – who is terrified of “other people” around heights) so we opted for a different, lesser known hike: Hidden Canyon. 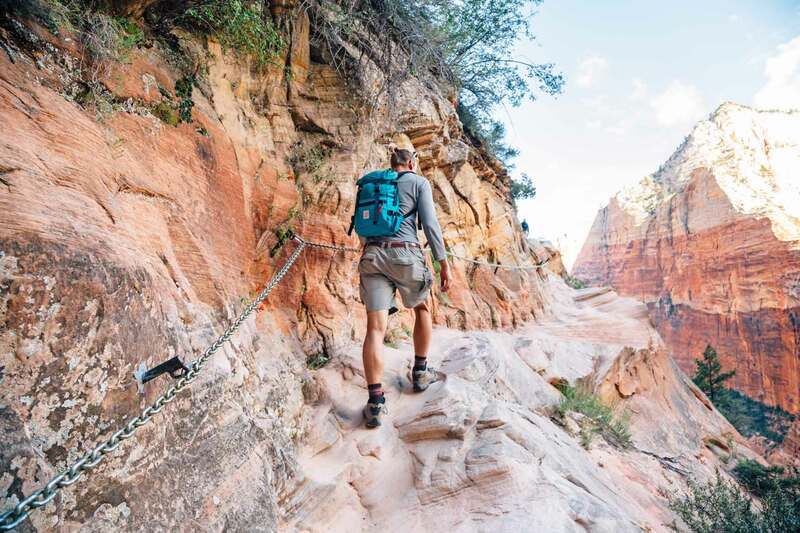 This hike begins at the Weeping Rock trailhead and ascends roughly 1000 feet from the main valley floor up to the entrance of a “hanging” slot canyon. Along the way, the trail narrows so much that the park has installed chains to keep people from falling off. While the hike up was certainly an exhilarating experience, it wasn’t nearly as anxiety-inducing as if we had done Angel’s. That’s because we had the whole trail virtually to ourselves. Stepping inside Hidden Canyon felt like entering a lost world. While we were definitely accompanied by a few fellow hikers, there was plenty of space for us all to spread out. The canyon extends back for a few miles, but the terrain gets increasingly difficult to traverse the further you go. We scrambled up rocks and crossed over fallen log “bridges” before we came to sheer cliffs wall neither of us felt comfortable climbing. Being able to spend a few hours exploring this quiet, sleepy canyon was truly a unique experience. Such a beautiful place, we hope to return some day. While Zion’s Main Canyon tends to get all the attention, few people know about the park’s other, less frequented entrance near Kolob Canyon. This section of the park cannot be accessed from the main canyon by road and has its own separate visitor center. 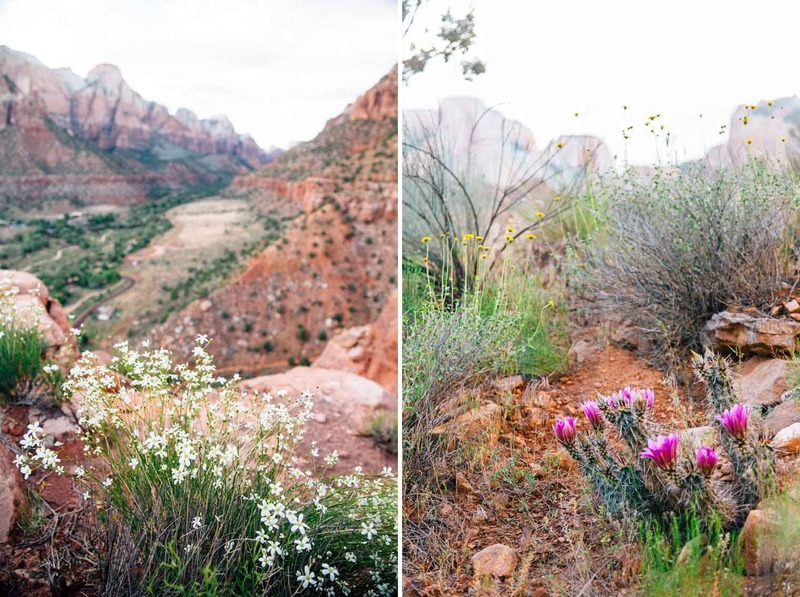 Having seen all the infrastructure that has been built up in Zion’s main canyon, Kolob felt like a different park entirely. Quiet, laid back, and plenty of parking. This place was definitely more our speed. A five mile scenic drive allows visitors to experience this section of the park, where narrow box canyons cut in the Colorado Plateau forming 2,000 foot cliffs. There are also a variety of hikes that start from this area including Camp Creek Trail, La Verkin Creek Trail, as well as Taylor Creek (South, Middle, North Forks). We decided to do the middle fork of Taylor Creek. 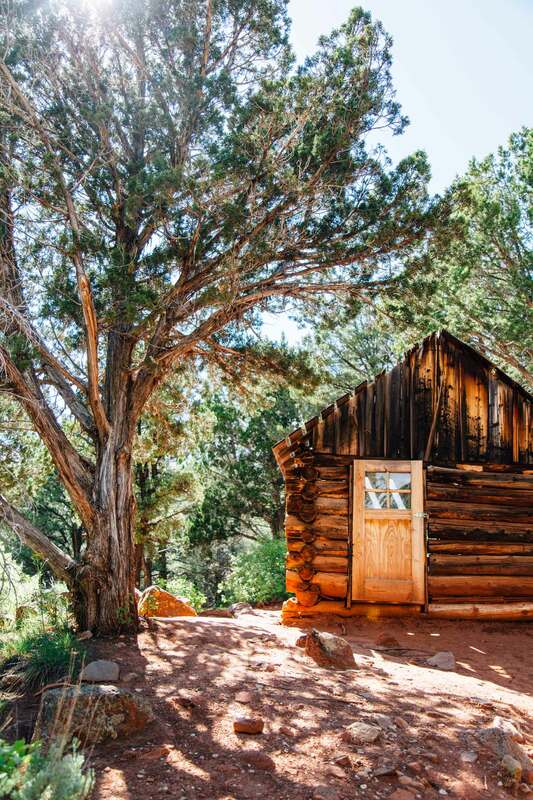 This fairly maintained trail leads visitors past a pair of historic cabins that were constructed back in the 1930’s – before the Kolob section was added to the park in 1956. Towards the end of the trail, hikers arrive at the Double Arch Alcove where the red sandstone is undercut and water seeps through. There isn’t a lot of elevation gain here, which makes perfect for a casual afternoon stroll. 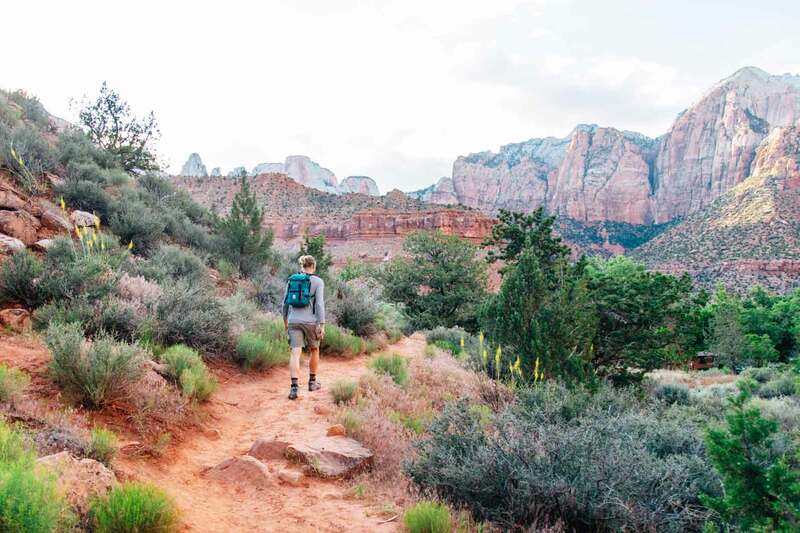 For more information about this hike, including a trail map, check out Joe’s Guide to Zion National Park. Observation Point offers one of the most stunning views of Zion’s main canyon, however getting there can be a bit of a challenge. While it’s a strenuous 8 mile round trip with over 2,000 feet of elevation, it is still one of the more popular day hikes in the park. Getting to the trailhead at Weeping Rock requires a trip on the intra-park shuttle, which doesn’t start running until 7am most of the year (6am during the summer.) That means even if you are the first person on the trail and hike incredibly fast, you’ll only get the view from the top to yourself for a few minutes before the waves of other hikers get there. However, we found a short cut. You can actually access Observation Point via the East Mesa Trail. This is a short and flat 3 mile trail that leads through the pine forests and grassy meadows of the east mesa. The start of the trail is actually on the park’s far eastern boundary, which is bordered by BLM land. We camped out here the night previous and woke up at 3:30am in order to catch sunrise from Observation Point. We arrived at Observation Point in the pitch dark without seeing a single soul. Down in the valley below, we could see headlamps of hikers just starting the trail. In a few moments, the sun began to rise and the veil of darkness was lifted to reveal the canyon before us. It was a spectacular experience. Using the East Mesa Trail to access Observation Point is a smart move if you want to catch an early sunrise of hang out late to watch the sun set. Anyone arriving from the valley below will be unable to get up there that early in the morning or will have to depart early in the afternoon to avoid hiking in the dark. So, you should have the place to yourself. Did we miss a hidden gem from Zion? If you’ve got any favorites, let us know in the comments, because we will definitely be returning to this spectacular park in the future! This article was written in partnership with the St. George Tourism Board and Travel Mindset. For more information about attractions in and around the St. George area, visit: www.visitstgeorge.com. You can also follow them on Instagram @atozion. 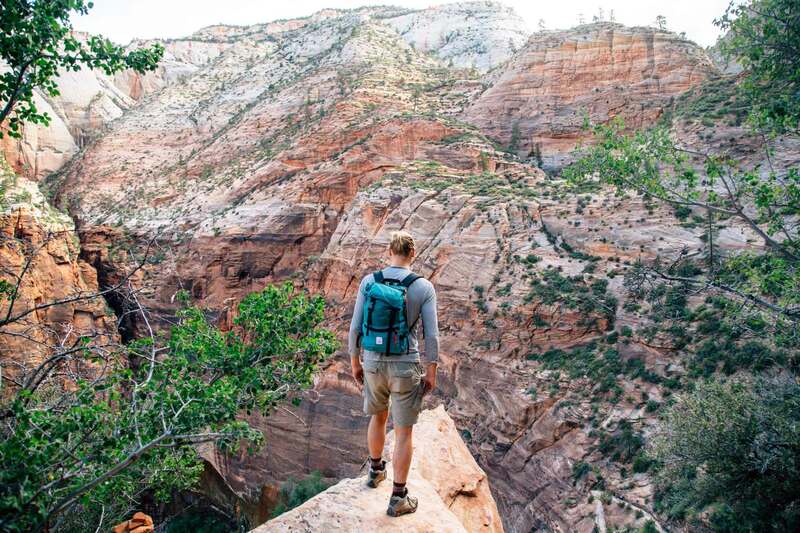 You give great advice on lesser-known hikes at Zion National Park. My wife and I are planning a 3-day trip out there and want to make sure that we are seeing all that we can. We are planning in staying in a hotel at Zion National Park so that we can hike even more while we are there. was wondering about the maps to get to observation point by the 3 mile trail. what time did you leave in the AM to get the sunrise? and can it be accessed by a front wheel drive car? we are staying outside of the park so what would be the best way to get there. You should be able to get to the trailhead with a front wheel vehicle (we did). I don’t recall exactly when we left to catch sunrise, but it’s going to change depending on what time of year you visit. We use this app called Magic Hour to tell us when sunrise / magic hour will be in our exact location. We hike at roughly 2 miles an hour, so for the 3-mile trail, we left 1.5 hours before magic hour started. Can anyone tell me what to expect in mid to late March? Will it be crowded and any wild flowers yet? What about rain? We will be heading there March 17 of this year. I am so glad I found this article! Great read! Nice article, I love it.The pictures are really amazing.My favorite place is “Observation Point”. Thank you so much for sharing! Heading out today to camp on BLM land outside of the park and was looking for the hidden treasures of Zion as the reason we go out to the wilderness is to soak in the beauty, not to be elbow-to-elbow with tourists!! Amazing and absolutely gorgeous pictures! We were looking at visiting Zion (and neighboring Utah parks), but were a bit turned off by the “business” of Angel’s Landing and the Narrows. When did you visit? This is a fantastic list! We enjoyed the Middle Fork portion of the Taylor Creek trail as well, and second the recommendation. 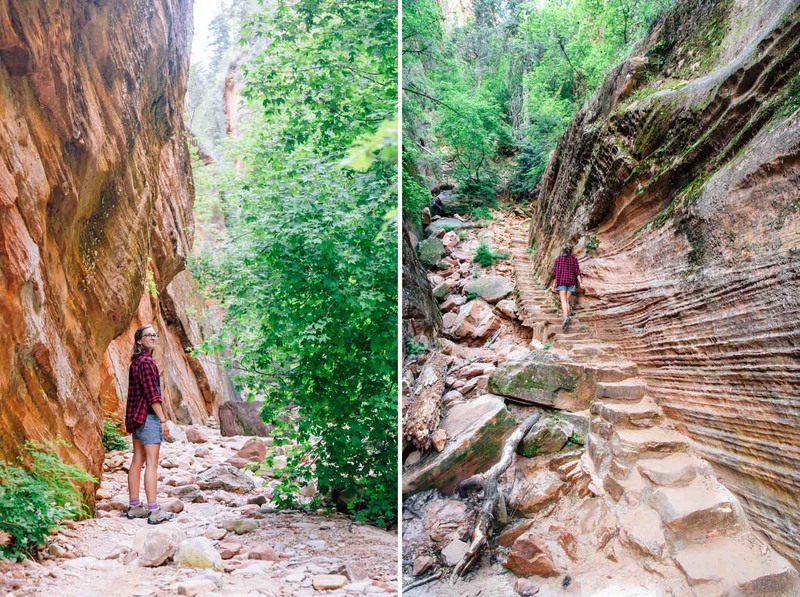 One more to add to the list in the Kolob Canyon area: Timber Creek Overlook Trail. While it’s short and easy, we absolutely loved the 360-degree views. We’ll have to check out Timber Creek Overlook the next time we go to Zion. Thanks for the suggestion. What month did you visit when you did your trip through Hidden Canyon? A mossy slot canyon sounds intriguing! Hope you had a great trip, Sassy! Zion is such a beautiful place, you really can’t go wrong regardless of which hike you take! We sure did! Observation Point was amaaazing! So glad we did it, and so glad you guys suggested it. Thanks for the Obsevation Point tip. Observation Point is one of my favorite hikes, I have seen where the trail intersects, but I never new exactly where it started. I will definitely have to check it out this fall. Loved this post! We hiked The Watchman trail last week but did it super early – got to the park around 6.30am and hiked up to see the sun hitting the canyon walls as it rose. Spectacular views – and there were maybe 3-4 others on the trail at that time. Came down and saw the queues for the shuttles – eek! Next time we’ll try one of the other routes you mention! Thank you for the great blog! I bet the Watchman trail is a great place to see sunrise! Being an early bird definitely is the key to enjoying relative solitude in a place like Zion. Those shuttle lines get crazy later in the day! Yeah, it was pretty bonkers when we were there too. Can’t imagine what it would be like if they didn’t have that shuttle system. We did Emerald Pools too! The upper was our favorite. We didn’t see any toads, but we definitely heard them. Great insight and ideas! We will be getting into the Zion area in the later evening and are planning on camping on BLM that first night. Is there obvious BLM camping area near the East Mesa trailhead? And that would be safe and manageable to find in at dusk? Like most BLM land, it’s not clearly marked. We were using the Benchmark Utah Road & Recreation Atlas, which has BLM land marked on it, but since there was no cell service out there we couldn’t 100% verify we were on it – although we’re pretty positive we were. By the trailhead, there were a bunch of pullouts and make-shift parking areas off the road. That’s where we stayed. This post is coming at such a great time! We will be in Zion next week. A friend of mine was just telling me about a short cut to Observation Point and how great the views are from up there. She said to google it (and now thanks you to guys, I don’t have to). Taking this as an informal second recommendation and a clear sign to get ourselves up there! So happy this article came at just the right time for you! We hope you have a fantastic trip! Zion is such spectacular place, no matter what part of the park you visit, you really can’t go wrong.